Dave Rodgerson is a Retail industry expert with more than 25 years of executive experience working with leading Canadian Retailers in sales, marketing, operations and strategic planning roles. He works closely with both clients and associations that share an interest in enhancing the consumer experience. Mr. Rodgerson's expanded bio is provided at the end of this article. The 2013 shopping season is one of the shortest in history. With only 26 days between Thanksgiving and Christmas its 6 days shorter than last year. The end result is that retailers have almost a full week less to capture the business available to them through the holiday season. That has prompted a number of analysts to suggest that Thanksgiving 2013 would be a bigger shopping day that it has been in the past. The projection was accurate. According to IBM’s Digital Analytics Benchmark report, Thanksgiving saw a year-over-year increase of 19.7%. The “early” start to the shopping season may prompt retailers to allocate more focus on Thursday as the drop date for future promotions coming into the week. In Canada the day isn’t recognized as Thanksgiving or a holiday, but that didn’t prevent some retailers from tagging the day as “Grey Thursday”. Analysts at Accenture have suggested that in time, Thursday could become the largest sales day of the week. It makes sense when you think of the competitive nature of retailers and the challenge of capturing as much business as possible in a short window of time. It was interesting to note that the largest change in Thanksgiving shopping came in the form of mobile transactions. In the past, shopping on mobile devices has traditionally stayed below 20% of total online volume. This year, 25.8% of online sales were generated by mobile devices. There is an interesting split in the use of mobile devices during the Thursday to Monday shopping period. Smartphones drove 24.9% of all online traffic on Black Friday compared to tablets at 14.2%. In this sense they established themselves as the device of choice for browsing. They are much easier to use when shopping in stores as well, since most retailers do not offer Wi-Fi and most tablets are not equipped with 4G connectivity. Tablets were however the device used more frequently to complete purchases. Tablets drove 14.4% of online sales, smartphones accounted for only half that figure at 7.2%. Tablets also captured a larger basket than sales attributed to smartphones by almost 19%. Cyber Monday did not disappoint anyone. Online sales grew by 20.6 percent over 2012. The average order value was $128.77, down 1 percent year-over-year which again makes the point that more people are making the shift to shopping online. Cyber Monday also generated a higher conversion rate on carted items. Shoppers actually purchased the items they added to their online shopping carts at a 12.6 higher rate on Cyber Monday than Black Friday. Another trend that is becoming more apparent as online shopping increases through the holiday season is the influence of social media. Websites like Pinterest and Facebook are generating some of the traffic that contributes to online sales. While this percentage is small, (less than 1%) there is a growing trend of shoppers who are referred from these sites to online retailers. On average, holiday shoppers referred from Facebook spent 6 percent more per order than shoppers referred from Pinterest. Facebook average order value was $97.81 versus Pinterest average order value which was $92.40. Facebook referrals converted sales at a rate 38 percent higher than Pinterest. It will be interesting to watch how retailers connect with mobile shoppers in the future. On average, retailers sent 77 percent more push notifications during the five day holiday shopping period (the alert messages and popup notifications from apps installed on your mobile device), when compared to daily averages over the past two months. The average daily installation of retail application on smartphones also grew by 29 percent using the same comparison. This would seem to indicate no loss of appetite on the part of consumers for smartphone tools that enable their shopping. Dave Rodgerson is a Retail industry expert with more than 25 years of executive experience working with leading Canadian Retailers in sales, marketing, operations and strategic planning roles. He works closely with both clients and associations that share an interest in enhancing the consumer experience. His work has included consulting engagements with such firms as Tesco supermarkets in the UK, Canadian Tire Corporation, Target Department Stores, Imperial Tobacco, Walmart Canada and Sears Canada. He has played an active role with the National Retail Federation, the Retail Council of Canada and the Conseil Québécois du Commerce de Détail. More recently, Dave has been speaking about emerging technologies and their impact on the customer experience. His audiences have included Unilever’s Global R&D team and Pepsi’s North American R&D group. He has been a featured speaker at Customer Engagement Technology World and the Canadian Gaming Association national conference. Dave has been a member of the faculty of Meritus University where he taught Marketing in their School of Business. In addition, he is on the Board at the University of Alberta School of Retail and works closely with the Ryerson School of Retail Business to support their program. In December 2013, he joined the Board of Directors at iSign Media Solutions. Dave holds an MBA from Queen's University in Kingston, Ontario where he focused on marketing strategies. "Black Friday", "Cyber Monday", "Dave Rodgerson"
Despite the hype, almost 3/4 of Canadian shoppers avoided this year's Black Friday sales. These figures corroborate anecdotal retailer reports. did not participate in Black Friday sales, substantially lower than many pre-event forecasts suggested. Interestingly, 28% browsed Black Friday promotions but in the end did not pull the trigger on a purchase. This aligns with DIG360 observations that Canadian retailers appear to be well organized on inventory levels and not so quick this year to be panicked into early and deep discounting. However, the good news for Canadian retailers is that most of those shopping for deals stayed in Canada. While it does not take more than a few hundred extra cars to back up a border crossing, only 2% of Canadians cross-border shopped US stores for Black Friday deals (similar to our findings in 2011 and 2010). A slightly higher number of Canadians (4%) shopped US websites. “According to retail executives with whom we spoke, the 20% of Canadians who shopped stores here at home generated a decent kickoff to the Holiday shopping period,” noted David Ian Gray, DIG360 Retail Strategist, “this is a good reality check rather than a disappointment.” Gray points out that Black Friday in Canada is less a reaction now to cross border spending, and more about encouraging Canadian consumers to begin their Holiday Shopping – particularly with fewer weekends in December this year. The survey was developed by DIG360 and completed by a representative sample of 1,005 Canadians 18 years old and over from the AskingCanadians™ online research community. The survey was conducted in English and French from December 2 - 4, 2013. 73% did not purchase a Black Friday sales item (27% shopped, compared with the 47% projected in a widely circulated pre-event poll). Of the 27% who did buy, only 6% crossed the border and bought from US store (fairly similar to 2011); 13% shopped online from a US website (up from 2011). Or restated, 1.5% of all Canadians cross-border shopped a US store; 3.5% of Canadians shopped online from a US website. 20% of Canadians (or 73% of those participating in Black Friday shopping) did so from a Canadian bricks and mortar retailer. In 2011, 11% of all Canadians shopped a store in Canada for Black Friday items. 10% of Canadians (or 38% of those shopping Black Friday) bought from a Canadian website (4% in 2011). 28% of Canadians browsed the deals, but opted not to buy. Quebec residents had the lowest participation in Black Friday shopping (17%) and lowest awareness of the event (9% unaware vs. 3% overall). Retailers were reporting a growing trend this year of online orders and in-store pickup. DIG360 Consulting Ltd. helps retail and “retail minded” executives focus or recharge sustainable growth through strategies that resonate with the right target audiences through better customer experiences and relationships. David Ian Gray leads DIG360; he is a recognized expert on shopper trends and retail strategies, producing high-impact business intelligence and original studies for and about the sector. DIG360 blends diverse professional backgrounds and personal beliefs full-circle, reflecting our strength in integrative thinking and making connections at all compass points around a challenge. "Black Friday", "David Ian Gray"
Retail Insider reminds you to be safe this Black Friday. Sadly, a Walmart worker was trampled to death during an American Black Friday sale five years ago. The following article discusses variable pricing's influence on crowds, written by our friends at Deal News. As well, Argos is offering Black Friday deals. We are providing a link to their Black Friday sales offerings. We've all heard the Black Friday horror stories about out of control crowds. But is it really dangerous to head to the store on Black Friday? What steps are retailers taking to protect customers and employees during the shopping holiday? Read on to see how merchants will try to maximize safety — and profits — during the Black Friday season. Our recent survey revealed that more than half of our readers plan to shop online during Black Friday. This finding was backed up by a recent Nielson study, in which 46% of respondents said they'd do their Black Friday shopping online. All of this could add up to smaller crowds on shopping's biggest holiday. Yet, despite these findings, the U.S. Department of Labor's Occupational Safety and Health Administration (OSHA) released a document urging retailers to put safety first on Black Friday. Citing the trampling death of a Walmart worker during a Black Friday sale five years ago, the press release emplores merchants to enforce crowd safety measures like providing "on-site trained security personnel or police officers," "not allowing additional customers to enter the store when it reaches its maximum occupancy level," and "not blocking or locking exit doors." OSHA revises and sends out its crowd control tips on an annual basis in an effort to protect retail workers, who are the most likely to be injured by rushing crowds. "The busy shopping season should not put retail workers at risk of being injured or killed," said Dr. David Michaels, assistant secretary of labor for occupational safety and health. 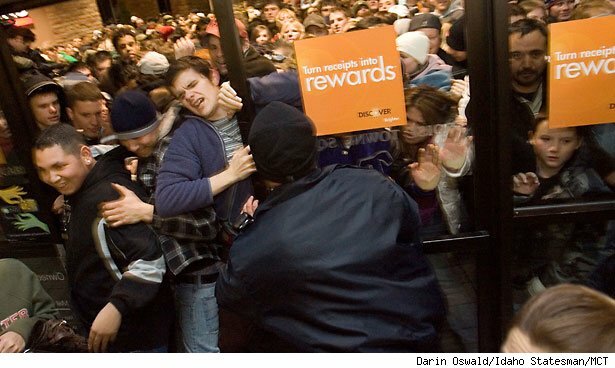 Implementing OSHA's crowd control measures is just one way retailers can prevent Black Friday mob madness. The pursuit of higher profits could actually lead to a safer Black Friday in some cases, as merchants implement more subtle forms of crowd control in the name of bigger sales. One overt way retailers are making making stores safer in the name of profits is by staggering Black Friday sales, so that the prices for select items only drop during a specific period of time. "At Walmart, for example, certain deals begin at 6 pm on Thanksgiving and then roll out throughout Black Friday," read an article for Market Watch. "Best Buy is doing something similar, with some deals rolling out at 6 pm on Thanksgiving and more on Black Friday ... the goal is to manage store traffic so aisles aren't clogged; for consumers, that could mean smaller crowds at any given time." Another subtle safety measure is matching in-store prices online. "People are going to shop the way they want to shop," Dan Toporek, Vice President of Corporate Communications for Walmart E-Commerce told ABC News. Toporek said Walmart "has about five million products on its website, compared with about two million last year, while about 99% of the items are eligible for free shipping." Putting more Black Friday bargains online still causes customers to spend their money at Walmart, with the added safety benefit of sending fewer patrons to the store. In the name of competition, Best Buy is also incentivizing brick-and-mortar consumers to visit its website during Black Friday. "Best Buy is offering free shipping for online orders over $25 and promising a 'significantly improved' experience for online shoppers after investing to make its website easier to navigate," reads aChicago Tribune article. Walmart is practicing another subtle form of crowd control with its "1-hour guarantee" on 21 doorbusters. Thus far the only retailer to try this tactic, Walmart is promising that customers who arrive during specified hours will receive the doorbuster they came for at its Black Friday price, even if the store runs out of stock. Since so many Black Friday riots tend to center around low-stock, low-price doorbusters, Walmart's guarantee could take the pressure off of deal-seeking crowds. 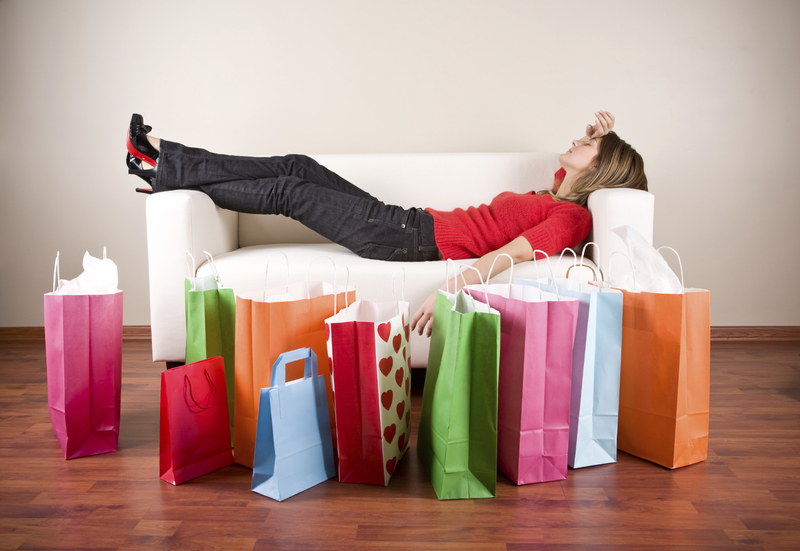 Readers, are your Black Friday fears assuaged? Or will you stay home and prepare for the worst anyway? Share your best/worst Black Friday horror stories in the comments below! Also, don't forget to stop by our Black Friday deals page for all the retailers' ads, as well as the latest news, analyses, and predictions. By now we all know what pre-Black Friday shopping looks like. Throngs of shoppers camped outside of retail stores, hoping to score one of the season's first doorbusters. Unfortunately, a majority of those shoppers are waiting in vain; landing a hot doorbuster requires more than just waiting in line. As professional deal hunters, we're here to show you how to increase your chances of getting that deal, and more importantly — how to decide if it's even worth the time and effort in the first place. To clarify: The term "doorbusters" is used a lot during the holidays, especially on Black Friday, and refers toultra-cheap items that brick-and-mortar stores sell to lure shoppers into their stores. Quality-wise, these products aren't going to win any awards. But when it comes to pricing, these goods are as discounted as they come. And the good news is, not all doorbusters require setting up camp in the cold. But if you're inclined to do so, here's how to maximize your chances of scoring a doorbuster deal. If you're attempting to snag the cream-of-the-crop doorbuster deals, then you'll have to choose wisely; while there may be time to secure multiple items during your trip, your best opportunity to get any limited-stock deals will be in the first few moments of the store opening. Don't waste that time on something trivial if you really just wanted one of those amazing TV deals, for example. To help you distinguish which doorbusters are worth pursuing, check out our Black Friday ad analyses. While many stores will post some choice deals in their Black Friday ads, in order to drum up hype well before the event, there's a very good chance that some retailers will have some last minute deals to reveal the week of. This is especially true if a store feels that it's being outshone by its competitors. A good way to find such timely offers is through store social media channels like Facebook or Twitter. While consumers had to jump through some extra hoops this year before getting any sneak peeks, there's a good chance that the immediacy of social media will be ideal forums for last minute offers. Once you know what doorbuster deal you're after, it's time to think strategy. Unfortunately there's no hard and fast rule for when you should arrive at a store in order to be one of the lucky few to get a limited-quantity doorbuster. According to our own experiences at suburban brick-and-mortar stores, you can generally show up about two hours early to get the most highly-anticipated doorbusters. That said, there are always the people whodecide to camp out for days. Luckily, this tactic doesn't seem to happen en masse, though you can easily tell if it's getting out of hand with a simple, advanced drive-by. It may be a bummer to see that there's already an unruly line outside of your preferred store, but at least you can assess whether shopping in-store on Black Friday will be a waste of time in advance. Even if you are one of those shoppers who does camp outside a store for three consecutive nights and are number 10 in line, that doesn't guarantee you'll get that doorbuster deal you've been waiting for. Doorbusters are very limited-stock items and it wouldn't be surprising for some stores only carried five (or perhaps fewer) of said item. The one absolute rule we can say about Black Friday doorbusters is that if you're not first in line, don't expect to get the deal you're after. Again, because retailers typically stock a limited supply of doorbusters per location, your chances of walking out of a store with one are slim. And even though Walmart is guaranteeing 21 of its doorbusters should they sell out, not many stores offer this guarantee. (And even with Walmart's guarantee, you'll have to return to the store sometime before Christmas to pick up your item.) All in all, the chances of a doorbuster selling out are very high. As a result, all shoppers should manage their expectations, so that if there are no doorbusters left to be had, shopping in-store doesn't end up feeling like a major disappointment. While there's no guarantee that every doorbuster will make its way online, we typically see extremely similar discounts and doorbusters from online merchants during Black Friday. Amazon in particular likes to undercut competitors throughout the weekend. In fact, in previous years we've noticed that 70% of in-store deals were available online for the same price or less. Of course, if there's one specific in-store item that you must have, hoping that it'll be online is a gamble (albeit one in which the odds are in your favor). The bottom line is: Doorbusters are bait. They're designed to get you in-store so that retailers can sell you a host of other less-discounted (and sometimes overpriced) accessories. Just remember, if you are lucky enough to snag a doorbuster, don't spend your savings on a $100 HDMI cable, extended warranty, or other astronomically expensive accessory. Make a list of the item(s) you want to buy and stick to it. Notably, most accessories can be found online at much cheaper prices than what you'd pay in-store. Remember, not every deal you see on Black Friday is a good deal. Now that you have an idea of what it takes to score a doorbuster you can relax a bit. You're prepared! But, if you're still unsure of whether or not you should shop in-store for doorbusters on Black Friday, check out our helpful flow chart below. Still confused? Then let us do the dirty work for you so that, come Black Friday, all you have to do is turn on your laptop and click "buy." Stay in the loop this holiday shopping season and sign up for email alerts for deals on all your wish list items. We laughed with horror at the video below. Who knew a mob of women could become so scary? (At an American Victoria's Secret store). The fighting is insane, and the brief video is a must watch! Below is a longer video with other Black Friday chaos. They are entertaining to watch but also horrific and embarassing. We really hope this madness wasn't replicated here in Canada. While all of this chaos was going on, we were sound-asleep safely in our own bed. Today we checked out some Vancouver (Canada) sales and the crowds were minimal and those around were reasonably polite. Though as of today, we've never seen so many women at once in Holt Renfrew's Vancouver shoe department!